After 10 years, Sony's PlayStation Store in San Francisco's Metreon shopping center - the only store of its kind - will close sometime this summer. The lease on the PlayStation store, home to many a launch-night lineup (the PlayStation 2, PS3, PSP, and pretty much any major title all had events there) runs out this summer, and Sony told GameSpot it will not be renewed. 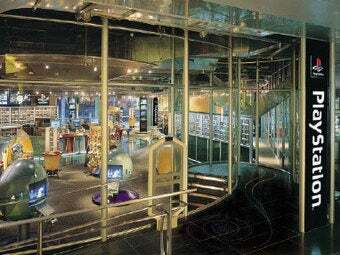 Sony developed the 350,000-square foot Metreon and opened it in June 1999. Sony sold its interest in the shopping center in 2006, but kept open its PlayStation and Sony Style stores. The Metreon's Sony Style will close after its lease expires March 31. Although there is no other PlayStation store, there are Sony Style stores at numerous retail locations around the country. "Our lease with the Metreon for the PlayStation Store will expire this summer and we have chosen not to renew it. While we are always looking at new avenues for additional retail exposure and space, we felt it best not to continue with a dedicated PlayStation Store at the Metreon at this time." The PlayStation Store was a slick retail outlet and a great place to kill time waiting for movies or for your friends to finish shopping elsewhere. And, of course, it was the scene for launch-night hype for the past 10 years. PlayStation gamers may feel a twinge of nostalgia, but it's not like Sony is shutting down an entire network of retail outlets. Anyway, if you're in the Bay Area or visiting, you have until the summer to pay your respects.